Easter is just a few day away. You may have noticed some changes to the platform Sunday. These are part of the preparations for our Easter program. 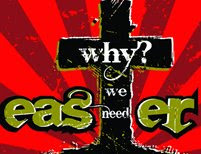 Our theme is "WHY DO WE NEED EASTER". The answer to that question is because we need REDEMPTION. Please invite your friends. Even people who would consider attending church on Easter are more likely to go where they have been invited. Offer to meet them in the lobby and sit with them. Let us all pray for them. The redemption of men and women was God's idea and continues to be His work. He has also made it clear that He wants to use you and me and His church in the process. Easter is a day for us to rejoice. Bring your heart of worship, your relatives and friends and lets make Easter a celebration.